Hip-hop star Kid Cudi has checked himself into rehab as he battles chronic depression. 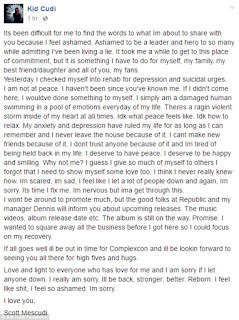 The 32-year-old singer posted a heartbreaking message to Facebook on Tuesday where he explained in detail his lifelong struggle with anxiety and depression, which he says has stopped him living his life to the fullest. The Pursuit of Happiness hitmaker - born Scott Ramon Seguro Mescudi - admitted he has been having suicidal urges and is not at peace with himself. 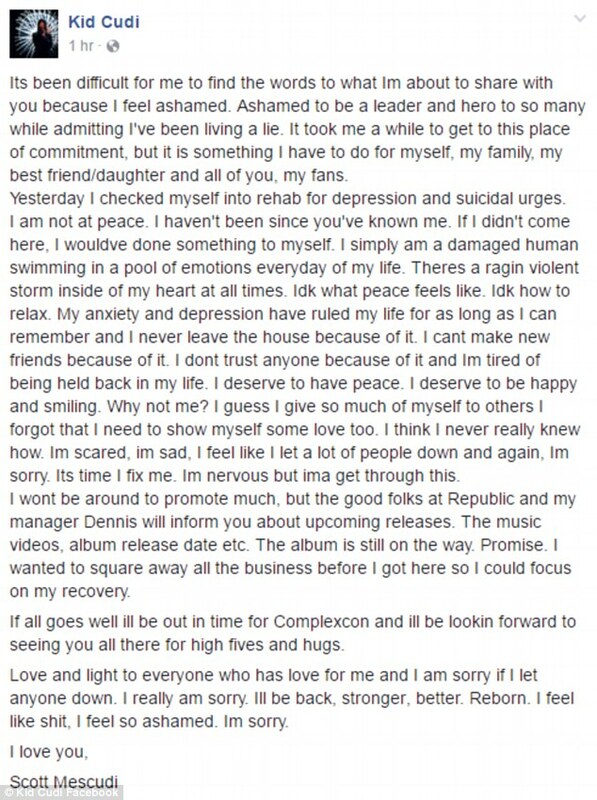 Cudi's message began: 'Its been difficult for me to find the words to what Im about to share with you because I feel ashamed. Ashamed to be a leader and hero to so many while admitting I've been living a lie. It took me a while to get to this place of commitment, but it is something I have to do for myself, my family, my best friend/daughter and all of you, my fans. 'Yesterday I checked myself into rehab for depression and suicidal urges. I am not at peace. I haven't been since you've known me. If I didn't come here, I wouldve done something to myself. I simply am a damaged human swimming in a pool of emotions everyday of my life. Theres a ragin violent storm inside of my heart at all times. Idk what peace feels like. Idk how to relax. The Cleveland native is scheduled to co-headline the ComplexCon festival along with Skrillex, Travis Scott and Virgil Abloh in Long Beach on November 5 and 6. His new album Passion, Pain & Demon Slayin' was meant to be released last week but got pushed back due to sample clearance issues. Rapper Kanye West, who signed Cudi in 2008, showed some support for the multi-talented star during his Houston show on Tuesday night. 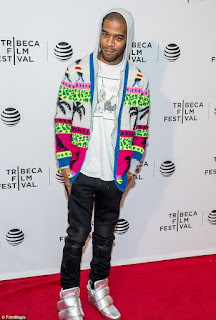 As well as a successful recording artist, Cudi is also an actor, songwriter, record producer, guitarist, music video director and film composer.